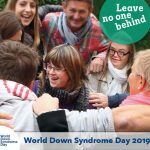 The EDSA-Family Exchange Programme facilitates families with a child with Down syndrome in different countries to get to know each other. 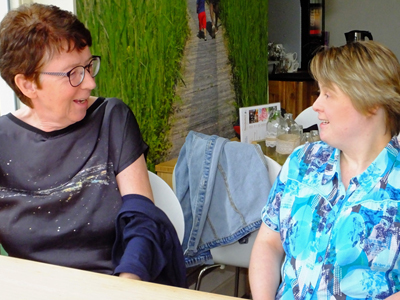 Since the time their children were babies, the families of David de Graaf in the Netherlands and Andrea Halder in Germany have had contact with each other. They have been visiting each other many times and always knew what the others were doing. 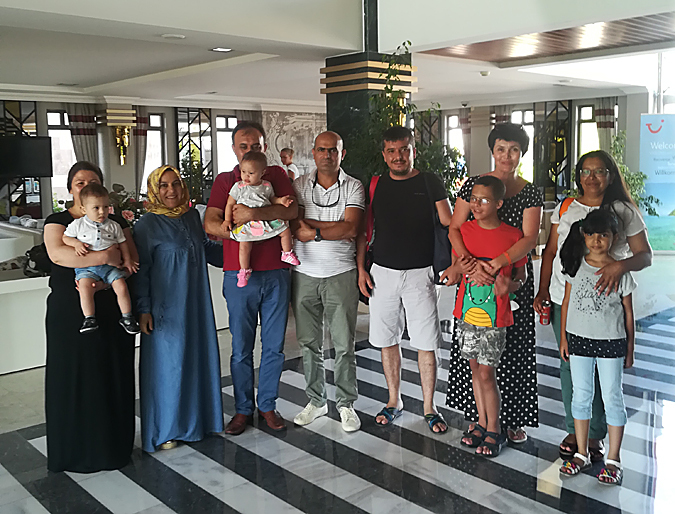 They exchanged experiences about mainstreaming, about intervention and education and as the youngsters grew older, about hobbies, work, independent living etc. 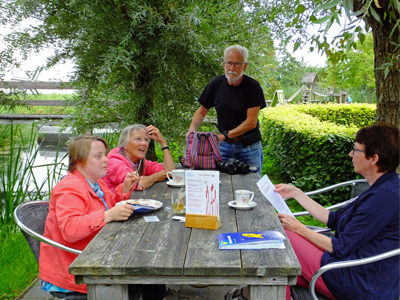 The pictures show the visit of Andrea and me, her mother, in the Netherlands August 2017. This time we all met at the working place of David, a teahouse in a national park. Three times a week he has a job as a waiter, and so was he the one who served the coffee, the sandwiches and the ice-cream. We spoke about job possibilities, working contract, what people with DS earn in both our countries and also about housing options. We see a lot of common problems, but also interesting alternatives in both Germany and the Netherlands. On the whole we know, there is still a lot of work to do. Both families, de Graaf and we, belong to the pioneers in the DS-field. 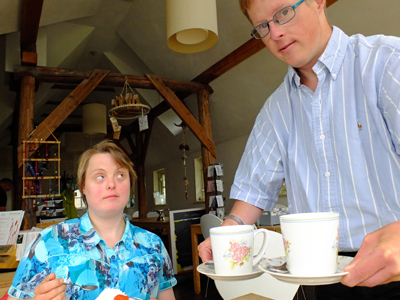 We dearly hope that younger parents will go on extending possibilities and services for people with Down syndrome. There is a great risk that service and support will be reduced again. 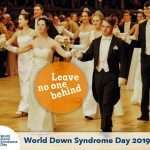 Therefor it is necessary to keep in touch with families in other countries, to learn from them, to share knowledge and good practice and to motivate each other to go on with lobbying for the interests of people with Down syndrome. It is worthwhile and an enrichment for all. 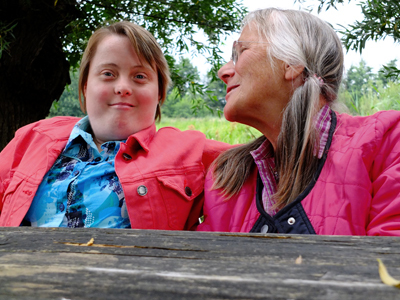 Our children with Down syndrome benefit from the contact with other youngsters in Europe. It widens their view, they experience another culture, see new places, make them tolerant and they might even try to learn some words in the other language. So why not use the Family Exchange Programme? How does it work? One of the best memories for me and my son Lev from Kiew/Ukrania this year is definitely our participation in the EDSA Family Exchange Program (FEP). 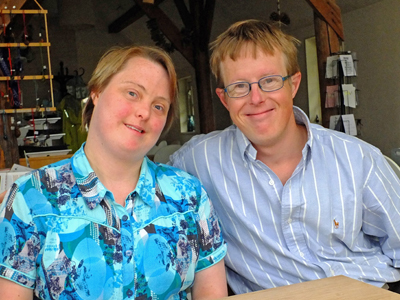 When we decided to spend a couple of weeks in a resort in Turkey I contacted FEP coordinator in Down Sendromu Derneği (Turkish Down Syndrome Association) with a request to find out if there was a family living in the area who would like to meet with us. And soon I was a member of a group of four(!) families, exchanging pictures of our children on WhatsApp and planning a meeting. We stayed in Club Felicia Village and I was very grateful for their permission to organize our meeting there. So on the designated day we met sweet Amine, handsome Osman, beautiful Asude and their parents. We spent a few hours exchanging knowledge and experience, sharing our hopes and doubts, learning from each other similarities and differences of lives in Ukraine and Turkey. All in all, it was a very good meeting. Even a language barrier couldn’t stop us. Whatever knowledge of English we had we used it. It was definitely fun and I’m adding a picture to prove it. 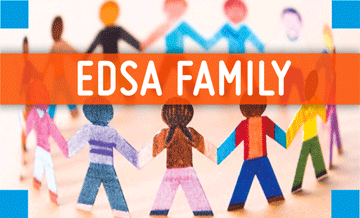 If your organization is a member of EDSA and you want to take part in the Family Exchange Program go to the website www.edsafamily.com and register. Make friends over the Europe, expand your horizons, learn new things, share experiences. Make all Europe your home. Enjoy!